Get the cowbells and signs ready. 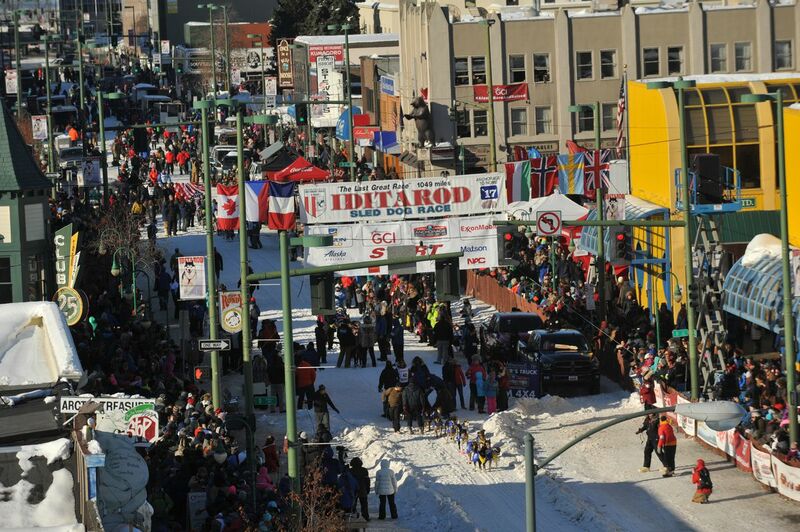 On Saturday, 67 mushers and their canine cohorts will depart Fourth Avenue in downtown Anchorage in the ceremonial start of the Iditarod Trail Sled Dog Race. An annual tradition for many Alaskans, seeing the Iditarod reminds us not only of our state's rich history but about our identity as well. Ever since the short race Dorothy Page and Joe Redington organized for the 1967 centennial of Alaska's purchase from Russia, which eventually led to the creation of the 1,000-mile contest we know today, the synchronicity between people and dogs has fascinated us. To me, it's a careful ballet of human care, feeding and pats on the head balanced with a dog's instinct to explore, run and please. I didn't understand that when I first moved to Alaska. Sure, as a kid I had followed the trajectory of mushers like Libby Riddles and Susan Butcher, women making great strides in what was previously considered a man's sport. Race updates came across the radio and television and we cheered from the comfort of our snowless Seattle neighborhood, appreciative of the effort but not really part of it. My family arrived in Alaska during the winter of 2005-06, and by March we considered ourselves ready to hunker down trailside for the craziness that is Ceremonial Start day. Never had we experienced anything like it — a cacophony of barks and yowls combined with race announcements, music and the smell of grilling sausages from sidewalk vendors. And the people! Spectators and mushers wearing fur hats, kuspuks, bunny boots and dirty overalls covered in dog hair and who-knows-what-else as they jostled for position just before the 10 a.m. start. Surely, we thought to ourselves, there is nothing like this anywhere else. Over the following two weeks we waited eagerly for daily updates, ticking off mushers as they finished (or scratched), worrying and waiting until a final team received the Red Lantern Award given for last place in Nome. Whether you view the race from downtown Anchorage or somewhere along the snowy trail after the restart at Willow Lake, there are few things that feel quite as Alaskan. Kids have grown up playing on berms near Fourth Avenue and Cordova Street while teams make the wide, sweeping turn to the right. 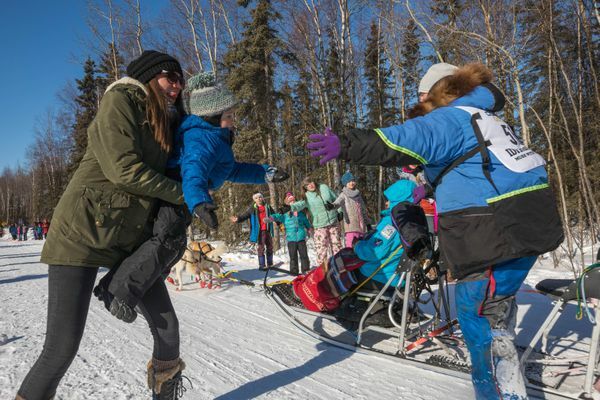 They've cheered for mushers wearing kilts and carrying flags from other countries, hands outstretched for booties and high-fives from teams heading through the forests or along frozen tundra. It's an Alaska ritual to attend the Iditarod, wherever and whenever we are able, and most families have favorite places to view the race. If you're new to the event, or are looking to expand your experience, I've compiled a few resources that may make the day (or days) educational, enjoyable and full of that timeless Iditarod magic. Mushers will start on Fourth Avenue in downtown Anchorage and travel 11 miles through the city to Campbell Airstrip, our favorite spot for both photographs and a true trail feel. Shuttles are available to the airstrip from Abbott Loop Community Park and Kasuun Elementary School, both off Elmore Road. Bring a sled for small kids and plan to walk a bit to the finish line. Campbell Creek Science Center will host its annual open house from 10 a.m. to 2 p.m., and families will appreciate the chance to warm up, gather information and have hot chocolate. Numerous other viewing spots can be found throughout the city. Mushers are all business at the restart, where the clock starts running as they begin their long journey to Nome. Willow Lake (and the Willow Lake Community Center) is 74 miles north of Anchorage along the Parks Highway, and Iditarod organizers suggest spectators take one of many shuttles available from various points between Anchorage and Willow due to intense traffic. Make sure to bring food, water, extra clothing, skis, snowshoes, sleds and a camera. The first checkpoint is at Yentna Station, 42 miles from Willow, and nearly the entire trail there is full of eager spectators. It's a blast to ski or snowshoe along the trail, and a perfect way to feel part of the action. For a fee, you can become an "Iditarod Insider" at Iditarod.com and gain access to blog posts, live feeds and a GPS tracking system for each musher. For kids, this can be an excellent way to learn more about topics like strategy, necessary supplies and checkpoint protocol. The Iditarod also has a mobile app available via Google Play or the Apple App Store for those wanting up-to-the-second updates including some live footage, race standings and other official news. The website's Iditarod Education section provides a wealth of race information, from history to dog care, and is my go-to resource for teaching kids the mechanics of mushing in a comprehensive way. Finally, I've created a trail scavenger hunt of sorts to help kids stay engaged at either the ceremonial start or the restart. Take it along, and see how many items you and your kids can check off as teams go by. Erin Kirkland is author of the Alaska On the Go guidebook series and publishes AKontheGO.com, a website dedicated to family travel and recreation in Alaska.